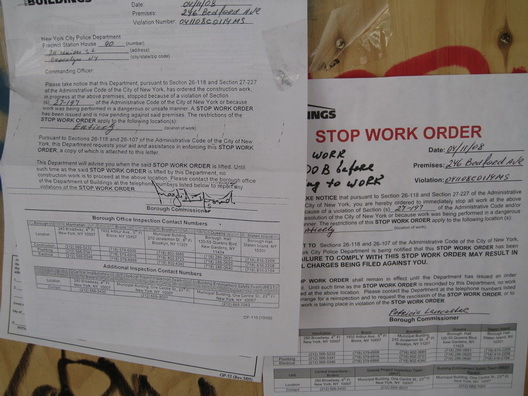 It may be our imagination, but we think we've noticed a definite uptick in the number of site sporting Stop Work Orders around Williamsburg in the last few weeks. It seems like the Department of Buildings has been hitting some work sites hard since about the third or fourth week of March. (Stop Work Orders, on the other hand, can be very fleeting things, imposed and lifted in as little as 24 hours, although some can linger for weeks and months.) We found this one at 246 Bedford Avenue, which is part of block where the big Quadriad development is going up. (It is not part of the Quadriad project, however.) It was for work being done in an "unsafe manner." This was the site of the Door of Death before it was closed off. The project also has one of those "10 day intent to revoke permits" issues right now.